With my mom laid up in bed after a week in the hospital my dad and I needed to run around town for groceries and whatnot because we’d basically been living out of the hospital and had NOTHING we needed. Daddy wanted to take me to the Montgomery County Habitat for Humanity’s new location near where we would be anyway and I was super stoked. After we actually went inside, we were crazy excited. We found furniture that was amazing, tons and tons of building supplies that we could only dream up ideas for and then came the mother-load… brand new, still in the box chandeliers for $5! Granted the box had gotten wet making the fixture rusted but for what we needed it for that was a non-issue. 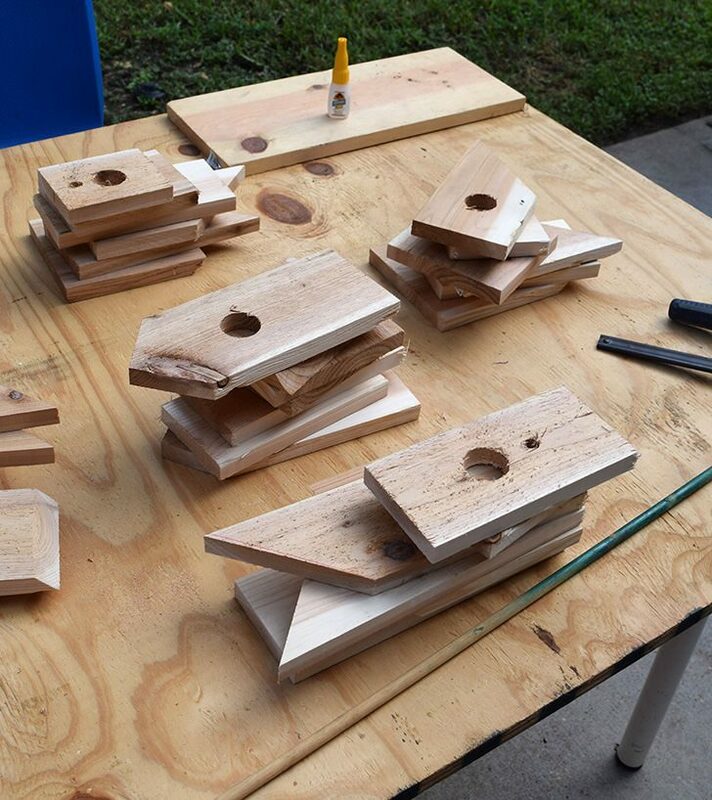 We snagged it and then my dad knocked out 5 birdhouses out of cedar using the new Gorilla Super Glue Brush & Nozzle. 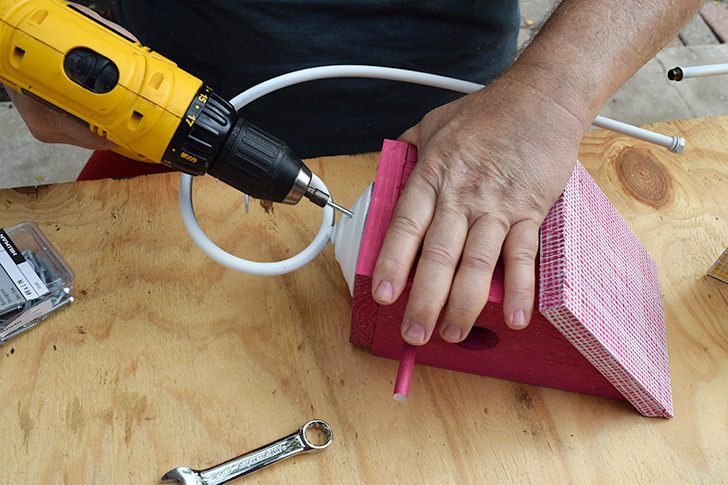 We had thought the idea of a brush for super glue would be pretty awesome and in the end we were right. The little fine bristled brush delivered the perfect amount of thicker and more easily controlled glue exactly where we needed it. 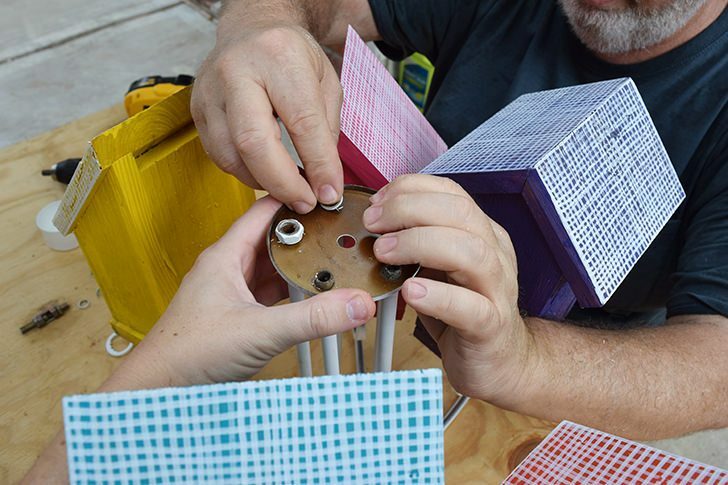 And since the glue works on plastic, wood, metal, ceramic, rubber, leather, paper and more our cedar birdhouses on a metal chandelier project was the perfect way to try out this new glue. Add in the fact that it dries, literally in seconds, and we were able to knock this business out as quickly as the rainy weather would allow us. And since the rain did put a hitch in production here and there, we got to open the bottle several times over, both the nozzle and the brush, and not once did the cap glue into place or the tip clog up which was equally awesome. 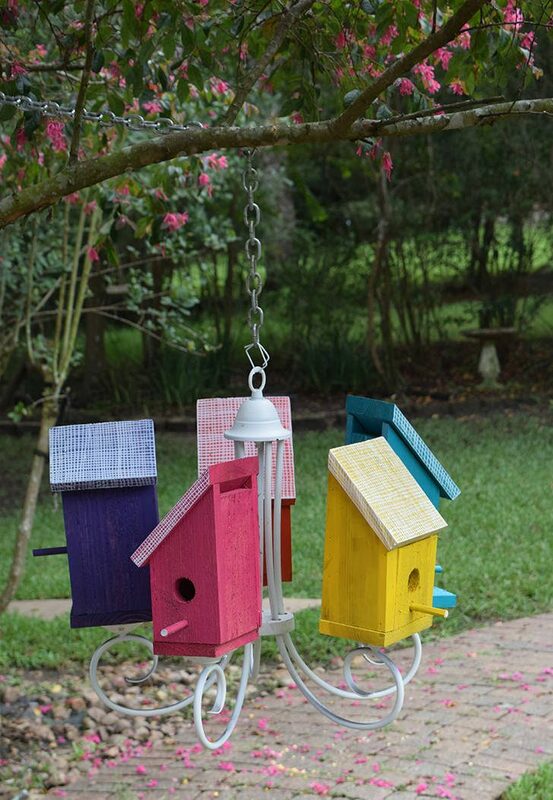 Now we (and by we I mean my dad :) built our birdhouses, largely because my dad thought it sounded like fun and we wanted to try the glue on wood to wood, but you can also easily purchase birdhouses at craft stores or even, perhaps, the craft aisle at big box stores. 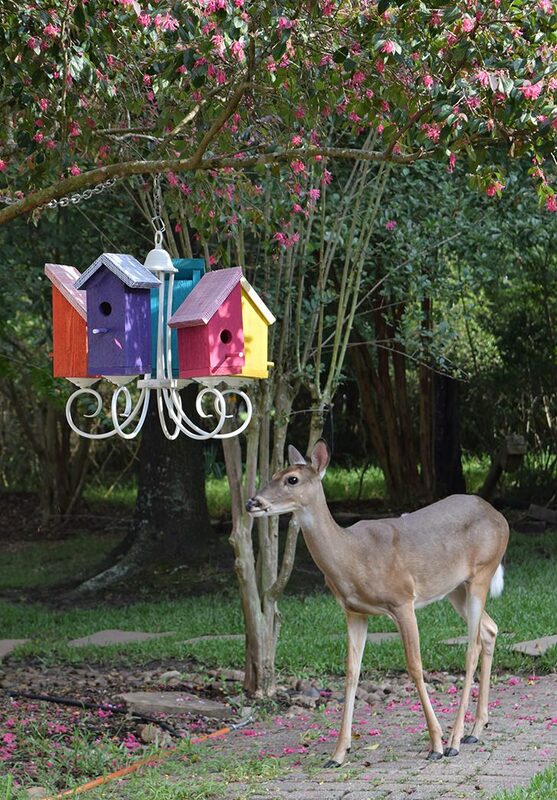 Whichever route you choose you’ll still have an amazing spot of color to hang in your trees! Here’s that chandelier. Since it’s not going to be used for lighting anymore we can totally get rid of all of the wiring. If carefully removed, it can be used to light up future projects. 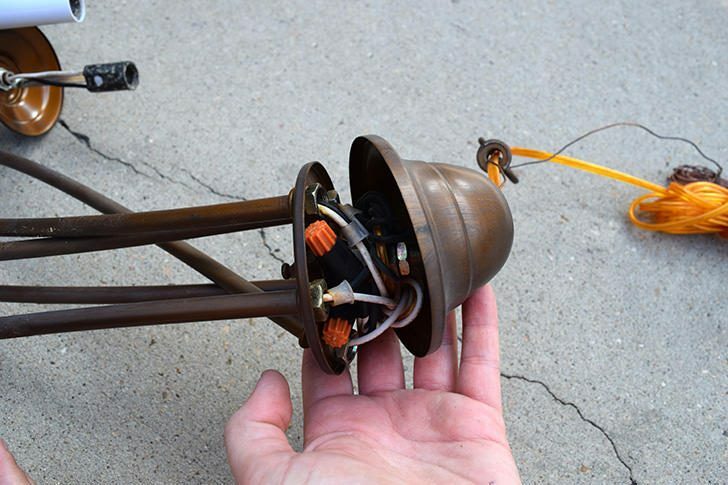 Since you don’t need to worry about getting it back together as far as an actual working lamp goes you can just stumble through getting this guy apart. Be sure to hang on to any nuts and washer as you go. Anything electrical remove and set aside for future use. 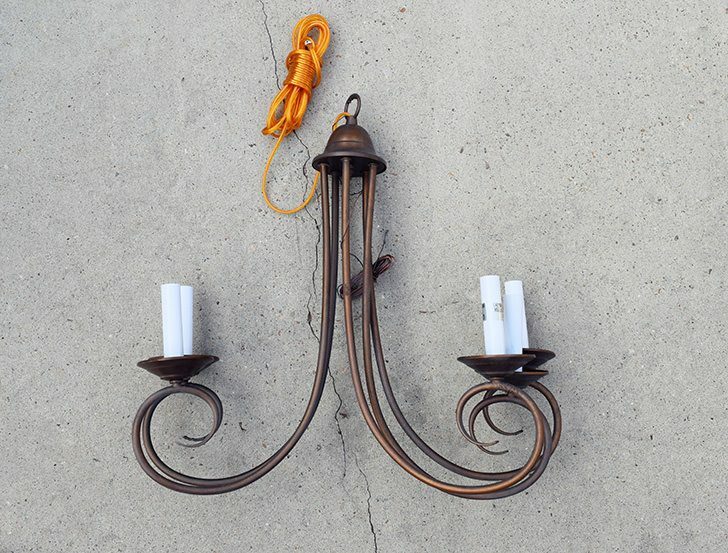 If you find that the wires are very tight within the arms of your chandelier these pieces might wind up being a loss. My dad, who is much stronger than me, was able to pull the wires out but I couldn’t manage a single one. If the wire doesn’t come out just snip it with wire cutters as close as possible to where it comes out of the fixture. Because a lot of my pieces were rusted getting the chandelier back together and holding tightly was dang impossible. 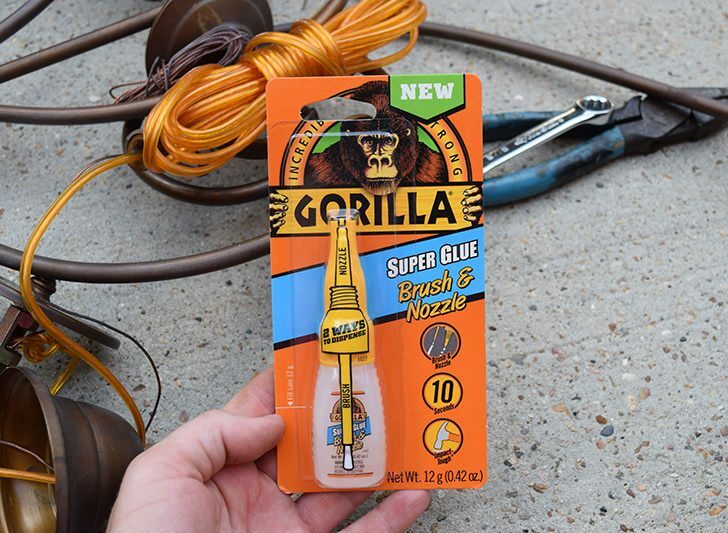 Right away my Gorilla Super Glue came in super handy acting as a thread lock while also keeping the pieces held together nice and sturdily. 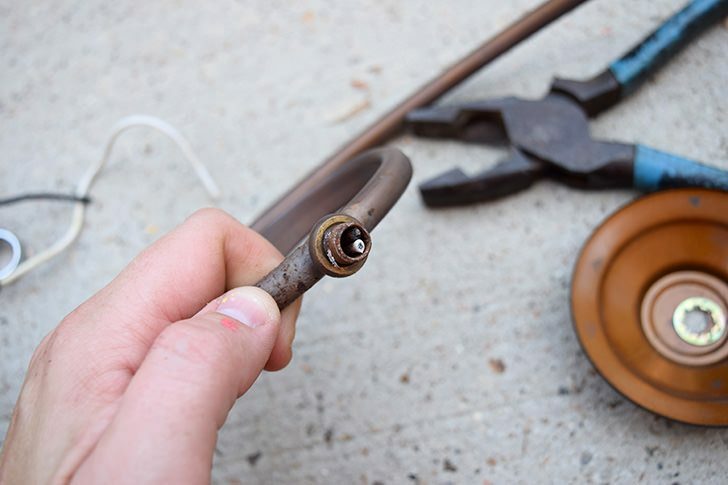 Simply brush a little bit of the glue onto the threads and then secure with your nut. 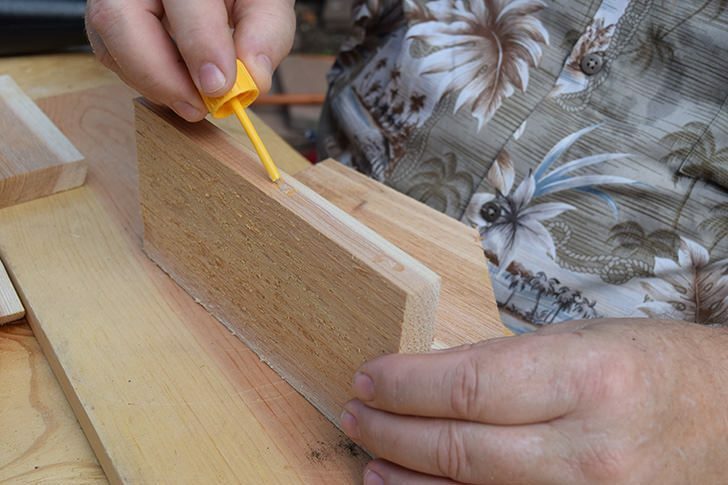 The glue dries in, literally, seconds so take care to properly thread the nut back on. 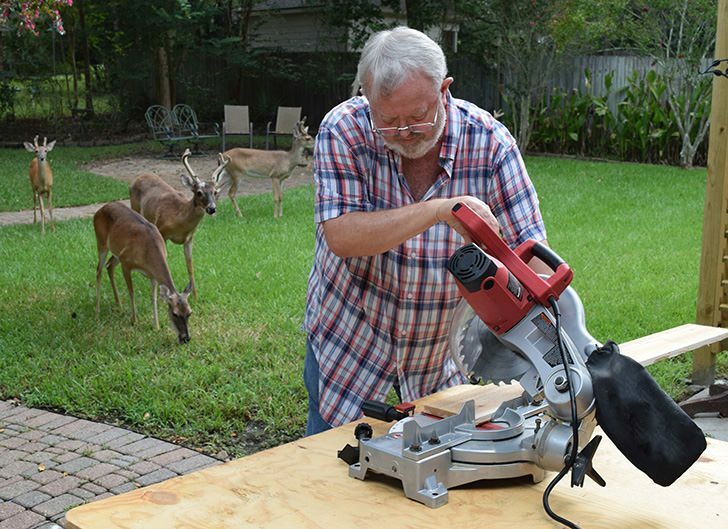 Next my dad busted out his mitre saw and some cedar wood boards and he started cutting them. 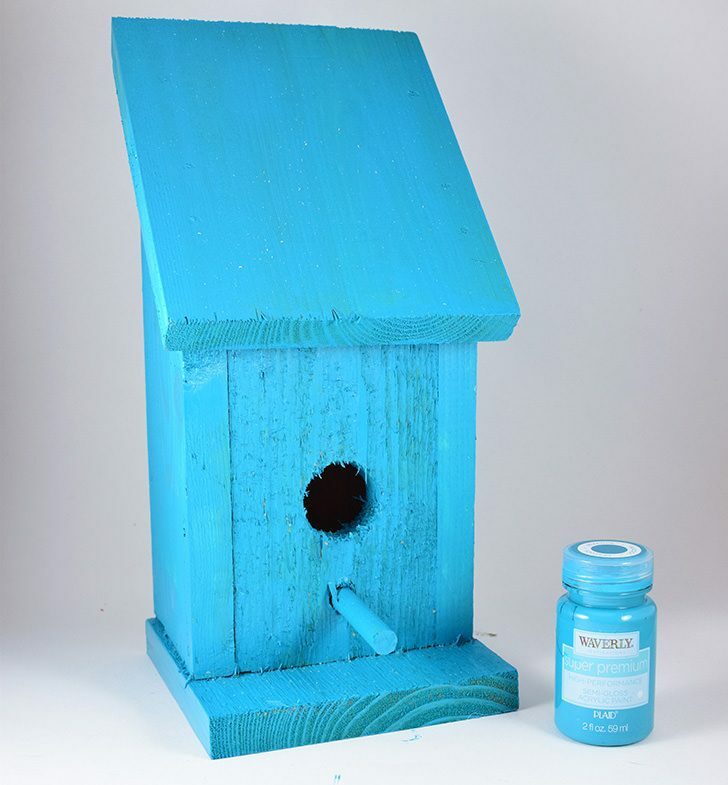 Now he eyeballed it and I don’t have any measurements for you, unfortunately, but there are tons of plans online or, again, you can purchase premade birdhouses at craft stores. 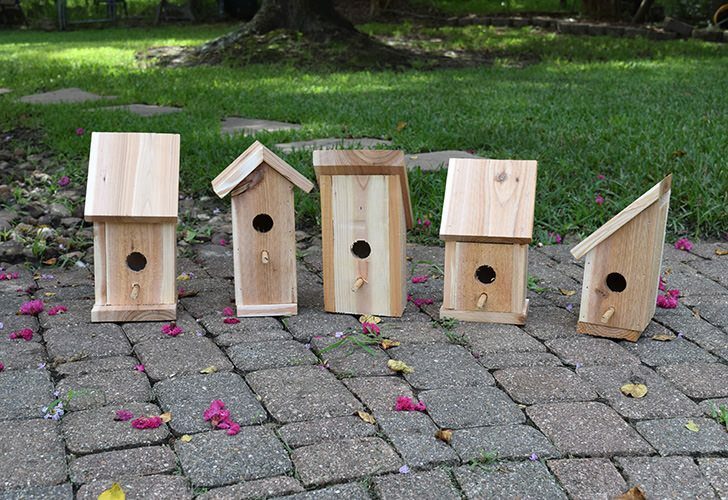 To make each house accessible by birds a 1 1/4″ bit was used to make doors on the front piece of wood for each house. 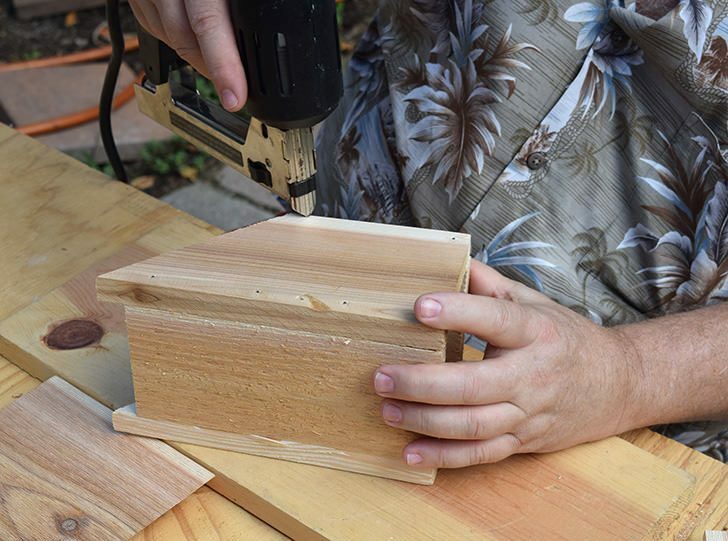 Another hole was drilled just below the “door” to place a dowel for the birds to perch on. 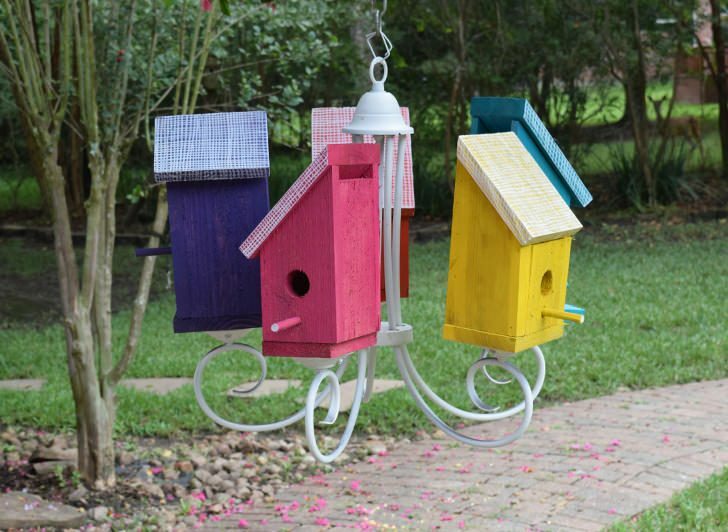 Others were planned to have a larger bottom piece that would jut out to act as an additional perch and give each house a slightly different look. My dad was able to build these houses so quickly because he used the Gorilla Super Glue. Brushed onto the wood he’d hold the two pieces together for just a bit before they were bonded together. 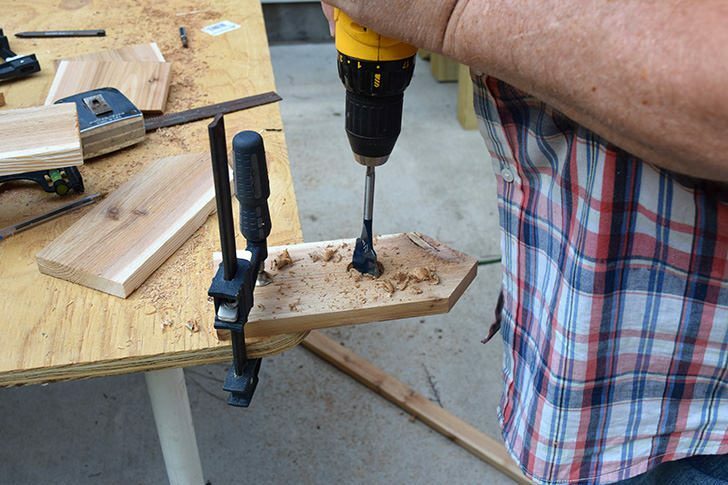 This made it very easy for him to use his nail gun to tack the pieces in place. 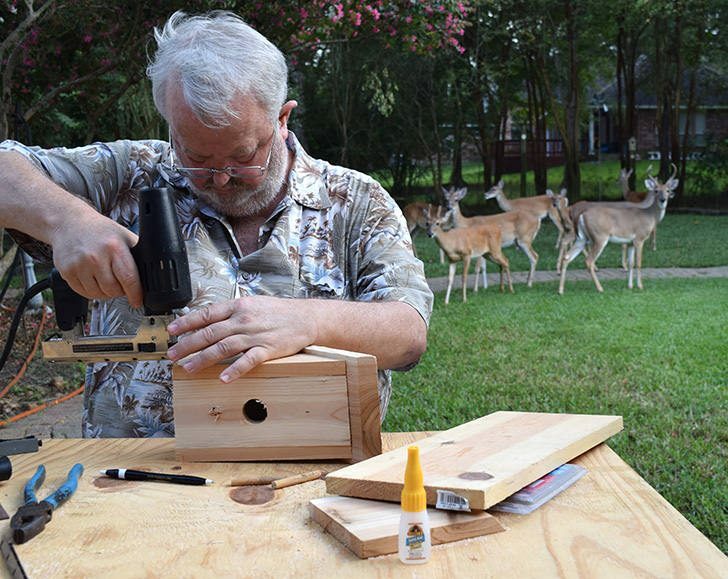 A small amount of glue onto each dowel prior to inserting it into the pre-drilled hole is all that is necessary for a permanent and sturdy perch for the new residents. With five arms on the chandelier and five birdhouses it was time to start making the birdominium! <— that’s my dad’s word! 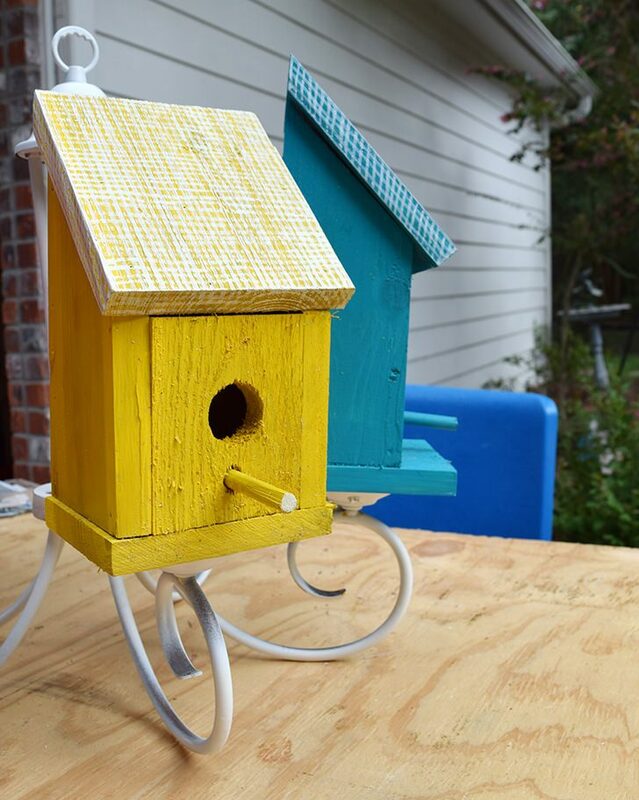 A solid coat of bright paint meant for outdoors covered each birdhouse and was allowed to dry. 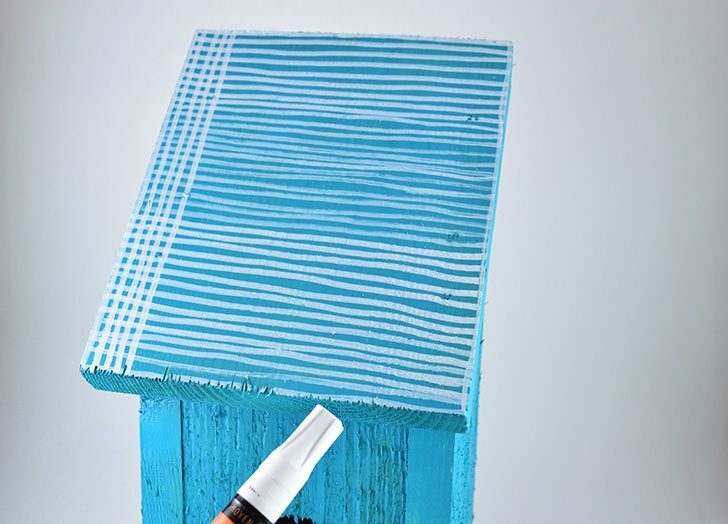 To make the look more cohesive a cross-hatch pattern was drawn using an oil marker on the roof of each. This helped them to be different yet match well enough that placing the crazy colors together made more sense. 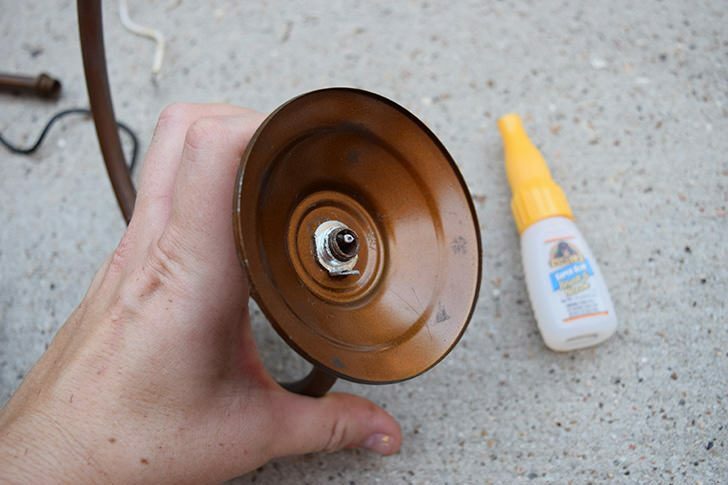 Once the paint is dry it’s time to secure your houses to each spoke of the chandelier. 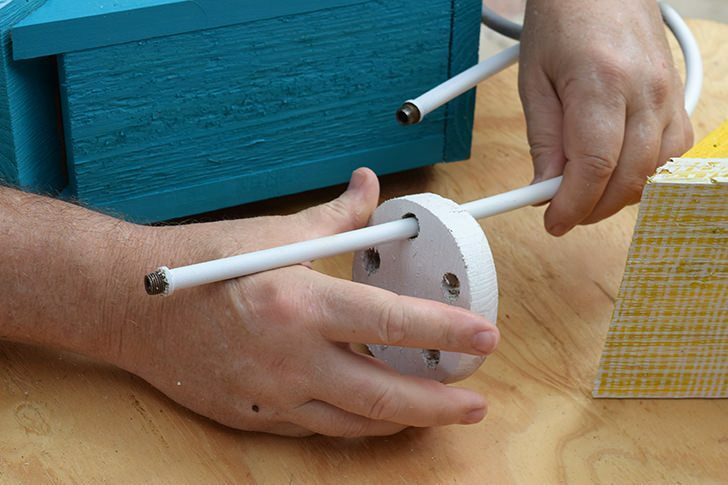 Drill a hole using a metal bit through the cup area of each arm. 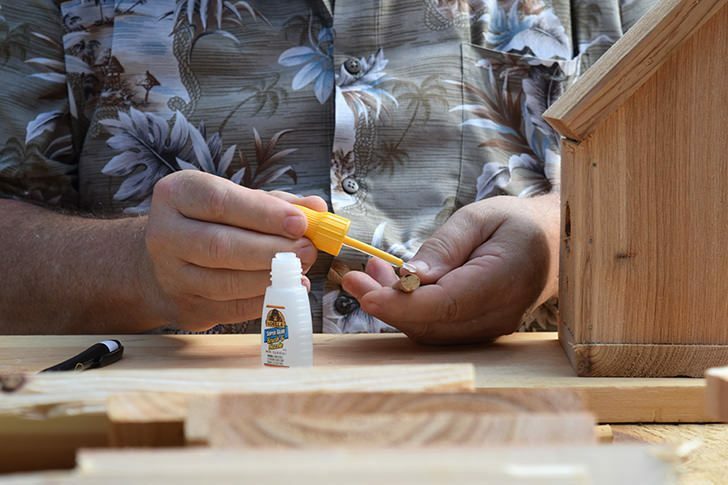 Apply a small amount of glue using the nozzle to the rim of each cup and then further secure each birdhouse with a wood screw. Because it turned out that our chandelier was really wobbly my dad cut a piece of wood to act as a stabilizer in the center of the chandelier. 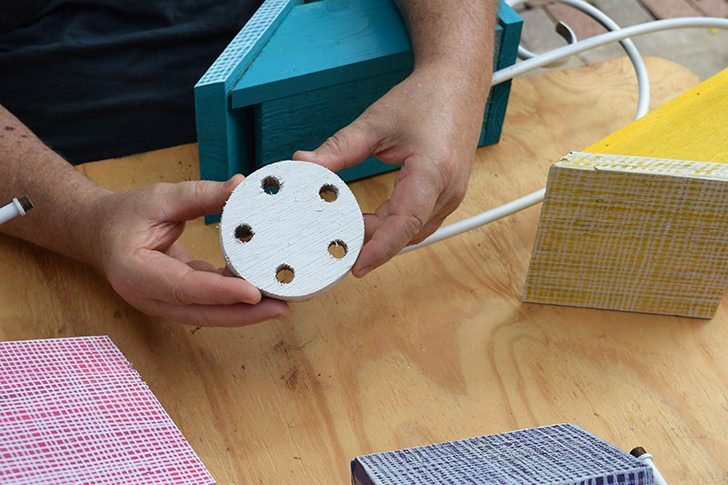 Simply cut a circle using a jig saw and sand down the edges to get a nice, round shape. Drill holes where each arm will go to help hold each steadily in place. 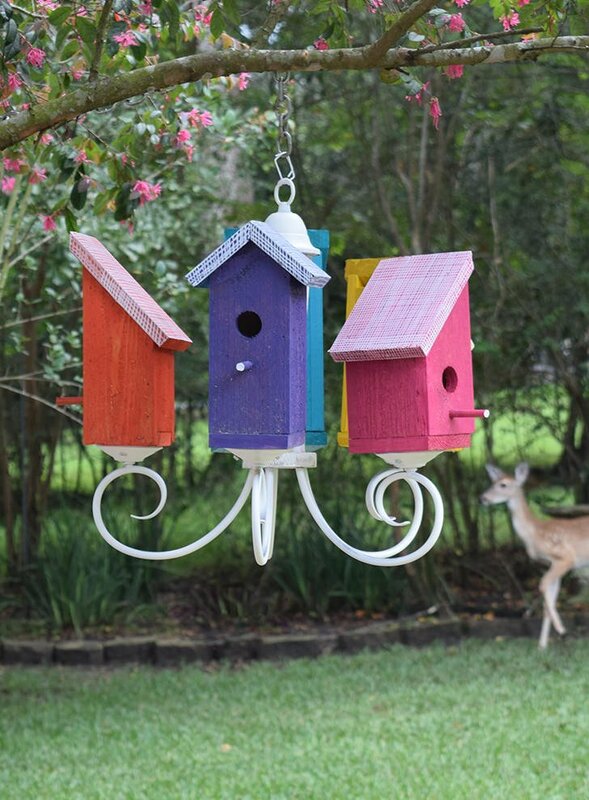 Because the birdhouses add some serious heft to each arm of the fixture you might need to grab a hand for the next step. 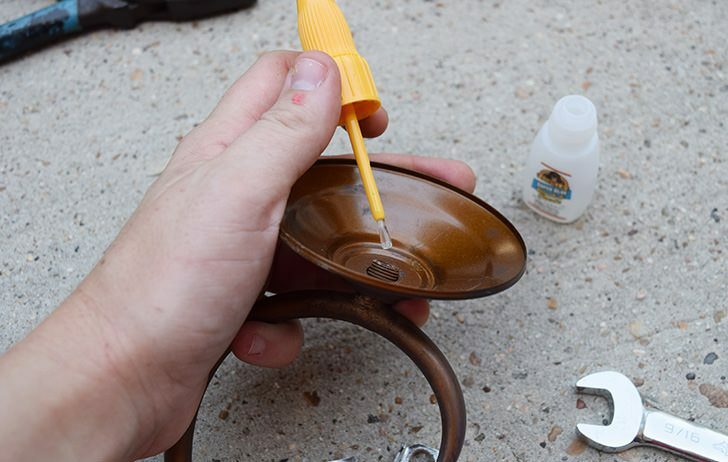 Simply replace the top portion of the fixture back together using the nuts that came with the light. Brush on a small amount of Gorilla Super glue onto the threads of each arm to act as a thread lock and help keep each arm exactly where it should be (especially if it’s a bit wobbly like chandelier was). Once pieced back together it’s ready to hang. Now you’ll notice that my spray paint job on the fixture itself wasn’t perfect and I had planned to touch it up, but once hanging it was hardly noticeable so I got lazy and left it! Using a hook my dad made from a wire clothes hanger and chain link we were able to easily hang this from one of my mom’s crepe myrtle bushes. 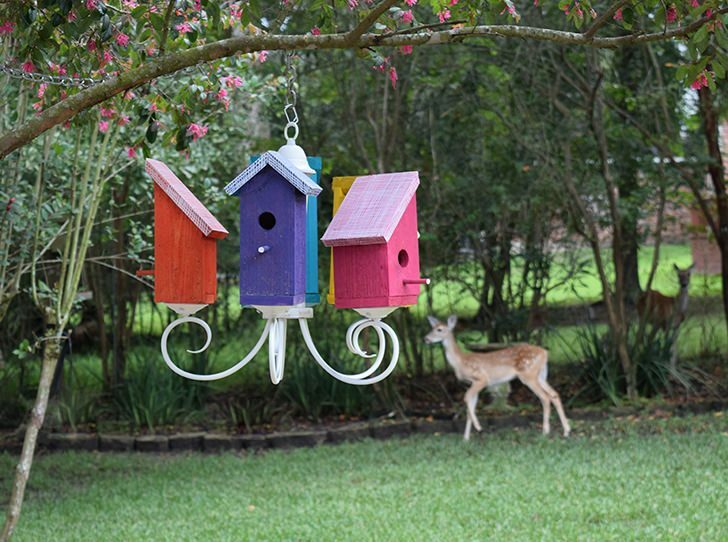 Although my mom couldn’t leave her bed to come and look at the birdhouse chandelier (or birdominium, if you will) we made for her but she did love it in the pictures we snapped and showed her! And my mom isn’t the only one in love. 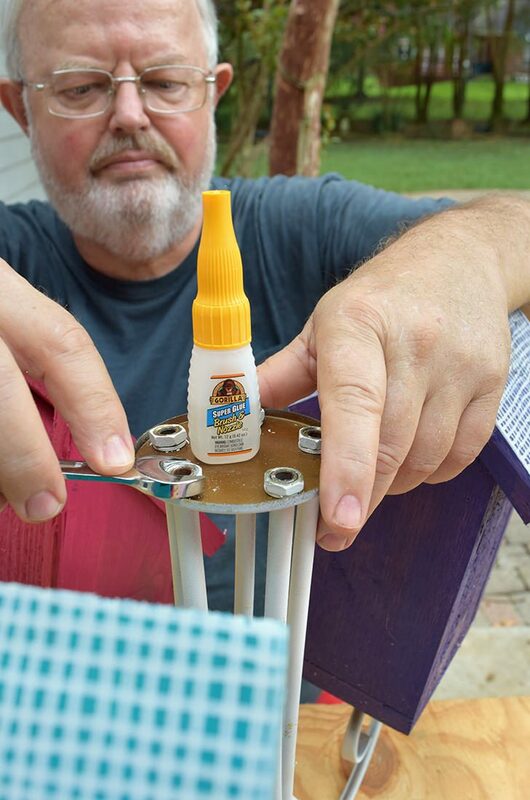 My dad decided he is a big, big fan of this glue and he’s keeping it! The little bottle was placed on his workbench just waiting for future projects. 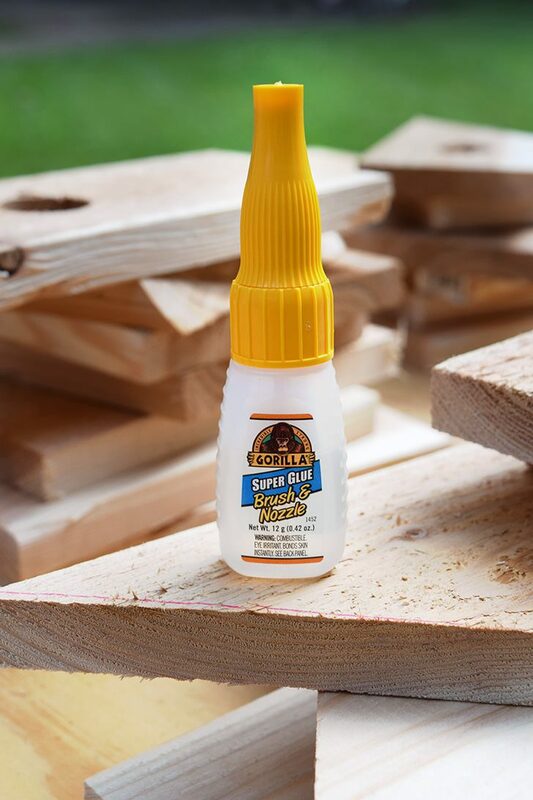 And since this glue works on virtually just about anything he’d want to build with AND it features Impact-Tough®formula that means it is reinforced with rubber to absorb bangs, drops and bumps he can build things knowing our klutzy family won’t destroy his work if we take a spill with it! I have become much a fan of your site! You have great ideas, and are very creative, not to mention , very funny, too! 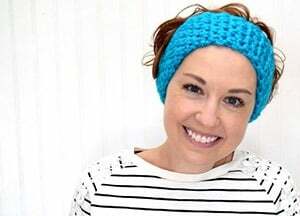 Thank you so much for the insightful articles, the great craft ideas, the awesome photographs and the life & humor you add into you writing. This art sets you apart from many other blogger and makes you a success! That is about the nicest thing anybody has said about my work (and because I live my work therefore my life :) Thanks so much. You MADE MY DAY!